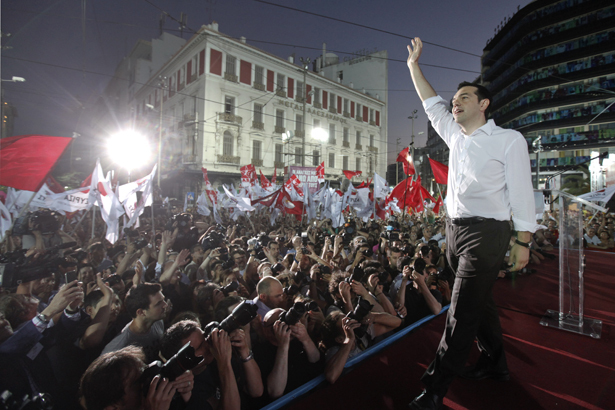 Could the Radical Left Win in Greece? The once-marginal Syriza coalition could bring down the current weak government—but to attain power it must get more union support. Greece’s new center-right government is set to impose fresh austerity measures in the fall, including further privatization of utilities, railways and ports. With unions already angry over wage and pension cuts, more work stoppages and demonstrations are expected. Three ministers have already resigned their posts, including a deputy labor minister who said the ruling coalition has no intention of keeping its campaign promise to renegotiate with the Troika (the European Commission, the European Central Bank and the International Monetary Fund), which had insisted on more austerity as a condition of continued aid to avert bankruptcy. The government is already unstable. With labor’s help, the people could bring it down, observers say, giving the once-marginal Coalition of the Radical Left (Syriza), the biggest opposition group in Parliament, a chance of forming a labor-backed government opposed to the Troika’s demands. Many Greek unionists feel betrayed by their traditional political ally, the Panhellenic Socialist Movement (Pasok), which has agreed to layoffs, hiring freezes and wage and pension cuts since the crisis began in 2010. With Pasok a diminished minority ally in the ruling coalition led by conservative New Democracy (Pasok has thirty-three seats, compared with Syriza’s seventy-one in opposition), it would seem that there is little choice for unions other than mass mobilization. Kostas Koutsodimas, a vice president of the General Federation of Employees (Genop, representing electricity workers), told me, “The major problem is collecting taxes. It’s not the salaries,” pointing to the Greek ruling class’s infamous tradition of evading taxes and the government’s unwillingness to collect them. Another labor leader pointed out that imposing additional regressive consumption taxes while diminishing wages, in the midst of deep depression, only freezes the economy more. And yet, the unions here have failed to take two available, and possibly overlapping, courses: link up with Syriza to fight austerity through parliamentary channels, and step up strike activity to force the ruling parties to acknowledge their demands or, better yet, force a government collapse. Labor leaders promise to use the strike weapon in the future, and some observers believe this is the calm before the storm that will be brought about by a fresh round of privatizations. Other activists believe the rank and file is simply too exhausted to engage in more action. Another theory is that just as decades of overt corruption—bribery in the public sector and widespread tax evasion—have drained the government of money, a more insidious political corruption keeps union leaders from making such a dramatic political break. Greek labor’s roots with Pasok are deep, and long precede this financial crisis. The party spent decades advancing social democratic reforms, but they were accompanied by a patronage system to ensure loyalty. It was once a commonplace that anyone who could bring in critical votes would be rewarded with civil service jobs for their children. Labor leaders loyal to the party would often get key appointments in Pasok-led governments. Amid the crisis that system is breaking down. In February, for example, Deputy Labor Minister Yiannis Koutsoukos resigned when the government agreed to austerity measures. He had previously been an officer at the Civil Servants’ Confederation. The bonds have weakened, but not enough. Sitting in a bar in the central Athens neighborhood of Exarcheia, a popular activist district, Syriza student activist Panos Petrou admits that it might sound bizarre for him to say the country’s labor leaders—who have led more than a dozen general strikes since the debt crisis emerged—are too conservative. But while one- or two-day transport strikes seem exotic to Americans, he said, these spurts of activism don’t pose a long-term threat to the existing order. The demonstrations give the appearance of labor militancy without putting the ruling powers in real danger. Syriza’s goal, Petrou explained, is to establish connections with workers at the grassroots, creating public assemblies for workers in order to organize outside the normal union structure. “Workers trust their [union] leaders, but there are small rebellions within the rank and file,” Petrou said. That’s happening, but not in ways that are immediately useful to Syriza. For example, radical unionists here celebrate a steelworkers strike west of Athens that has been going on since October despite a recent court ruling against it, although the major political player in that action has been the Communist Party, a go-it-alone Stalinist group that has no intention of working with Syriza. Petros Constantinou, an Athens city lawmaker from an anti-capitalist coalition not aligned with Syriza, points out that more and more workers have switched their votes from Pasok to Syriza and smaller left-wing parties. He adds that there have been some occupations of workplaces, and that if threats by Genop, the electricity workers’ union, to disrupt service come to fruition, the already weak government may be deemed powerless. But Constantinou charges that Syriza is concentrating too much on winning the next election rather than focusing on grassroots organizing. In the period before the government comes up with a new privatization plan, Syriza has a chance to capitalize on the anger coming from workplaces, union meetings and neighborhood assemblies. Too many Greek workers are still unfamiliar with the party’s program, so Syriza activists and MPs will have to fight for it at those gatherings. It will also have to forge closer ties to the growing numbers of young people who can’t find jobs, as well as the small merchant class who fear losing their businesses in the deepening depression. Greeks might still be divided in their party loyalties, but they are definitely united in what they don’t want: seemingly endless demands for more belt-tightening. Sitting outside a meeting of railway workers discussing how to deal with impending privatization, ticket-taker Vassilis Zavogiannis aired skepticism toward Syriza’s plan to oppose the Troika. For him, the only solution was a prolonged strike across many different sectors, one long enough to force this governing coalition—or a new one, if this one falls—to reverse course. Ari PaulAri Paul is an independent journalist covering politics and labor. He has written for the Guardian, Dissent, The American Prospect, Boston Review and many other outlets.